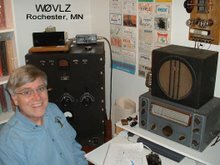 This is a blog about my ham radio experiences including vintage homebrew, QRP operating and the National Radio company. I was licensed as WN6ULH in 1966. My first shortwave receiver was a WWII vintage variant of a National NC100A. As a novice I used a military surplus BC-342 reciever and an Eico 720 transmitter. Then, when I left for college, I took a National NCX 200 transceiver mounted under the dashboard of my 1965 Mustang. My stations since then since then have included a Drake TR4cw transceiver and a Drake B line. Today my shack includes equipment dating from the early 30s through current gear operating CW, SSB and PSK31. I've built many pieces of my own gear including tube and solid state transmitters and receivers. My current interests include QRP operating, vintage home brew and the National Radio Company. Read more about these topics on my web sites at http://www.prismnet.com/~nielw/wa5vlz.htm and http://www.prismnet.com/~nielw/index.htm .